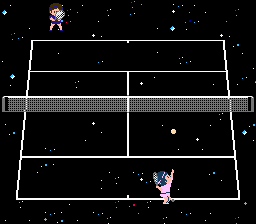 Family Tennis is a sports game for the Nintendo Entertainment System. 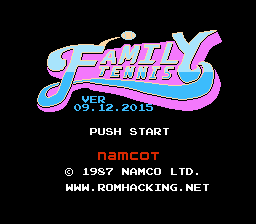 Here is an English translation for the NES title by Namco, Family Tennis. 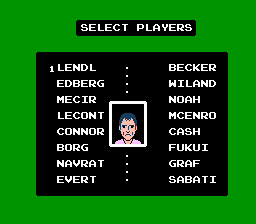 All the players names, tournament banners, coach pep talks, end score screens, and the password screen have all been converted to English. Also this patch includes a fix to the header which caused the ROM to originally have a split screen causing the game to be near unplayable. 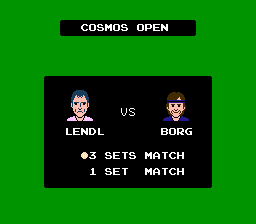 If you like Tennis or fun sports games without too much complexity, this is worth picking up and trying out. Enjoy! 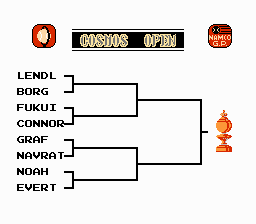 pacnsacdave Graphics Title screen, tournament banners, and end match screens.